This sumptuous plaid by 3 PALMA can be worn to protect you from chill, as well as a throw to decorate your couch and to snug beneath. 3 PALMA specializes tactile products to bring colour and softness into your living space. She is a trained tailor who personally produces every single piece by hand with the utmost care and dedication to detail, precision and quality. 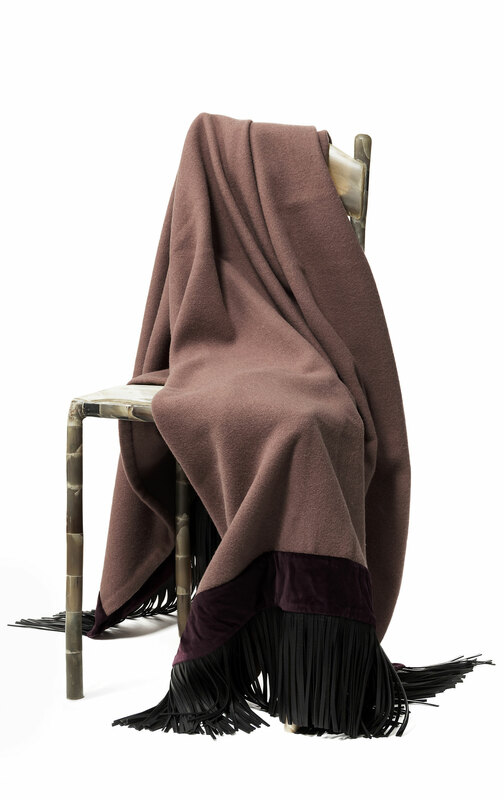 100% Wool trimmed with a cotton velvet border in burgundy, and nappa leather fringes. The fringes are handmade and glued back-to-back, so both surfaces are equally beautiful and therefore the plaid can be used from either side. 3 PALMA offers a smaller plaid also without the leather fringes. The colour schemes, material combinations, and sizes can be discussed with the client.